Independent Swiss dealer Robert Aebi is offering Volvo customers a chance to show their care for the environment by buying a ‘GoGreen’ articulated hauler – produced in the construction industry’s first manufacturing plant powered entirely by renewable energy and issued with a carbon offset certificate from the Fair Recycling foundation for the shipment from Sweden to Switzerland. 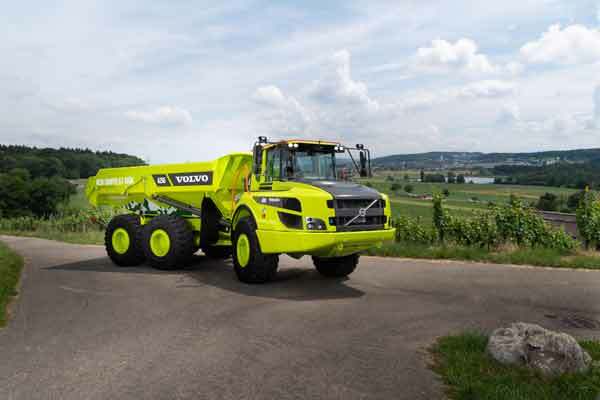 The ‘GoGreen’ package from Swiss dealer Robert Aebi is enabling customers to make a contribution to protecting the environment with the purchase of any new Volvo articulated hauler. This package includes a warranty extension and a selection of service options, but most importantly, a carbon offset certificate from Swiss climate protection foundation Fair Recycling. The certificate covers the transport of the machine from the factory in Sweden to the jobsite of the customer’s choice, plus a certain number of operating hours. As part of Robert Aebi’s move to become more engaged in climate and environmental issues, the dealer has signed an agreement with Fair Recycling for three years. Behind every carbon credit certificate issued by the foundation for the Volvo ‘GoGreen’ articulated haulers will be a refrigerator. Fair Recycling works to combine education with the practical recycling of refrigerators containing harming CFC greenhouse gases. Each refrigerator recycled under the agreement will recover approximately 50kg of raw materials and save the equivalent of a tonne of CO2. “Environmental care and sustainability are components of a journey that always has new goals to reach. We at Robert Aebi would like to make a contribution through our agreement with Fair Recycling to a cleaner future,” Schenk says. This journey that Schenk refers to, however, starts much earlier. All of Volvo’s market-leading articulated haulers – from the 25-tonne capacity A25G to the gigantic 55-tonne A60H – are produced in Braås, Sweden, which in 2014 became the company’s and the construction equipment industry’s first production facility to be powered entirely by renewable energy. The first Volvo ‘GoGreen’ articulated hauler, an A25G, has now rolled off the production line in Braås and made its way to the Robert Aebi headquarters in Regensdorf outside Zürich practically carbon neutral.